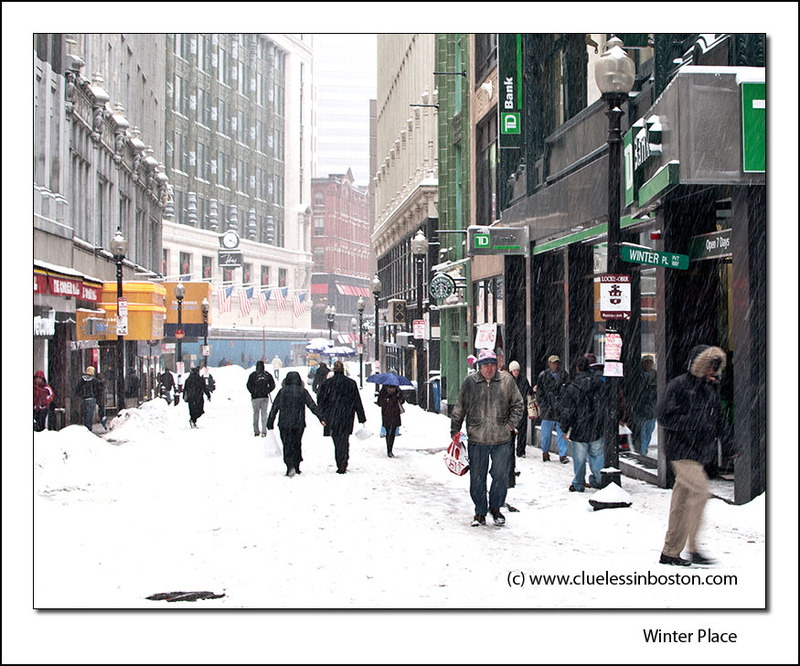 Boston is experiencing one of its snowiest winters in a long time and is becoming Winter Place. This view is looking southeast down Winter Street towards the facade of the old Filene's Dept. store on Summer Street. This picture and the last ones are very pretty. But this morning on french TV, I heard about the storm above USA, and they said it was about to reach Boston;The pictures showed quite hard times ! Stay warm and safe! Nice capture. I really like the sideways snow and the guy huddled in his parka in the corner. Passersby probably were questioning your sanity for pausing in the frigid temps to take a photo of this scene. Snow is a wonderful inspiration for you and Slim. These winter shots of yours have been great. Ah... Filene's. Another Boston icon. More memories...the original Filene's Basement! My husband and I couldn't drive our power chairs around there now! Aptly named Winter Street anyway! The snow in US does sound bad - stay safe! I like winter and snow. But only first 7 days. Stay warm! I must say that I'm a little envious of all that snow you guys are getting back there. Makes our sunshine seem a little boring here in Central Coast California! What store or business is now located in the old Filene's spot?